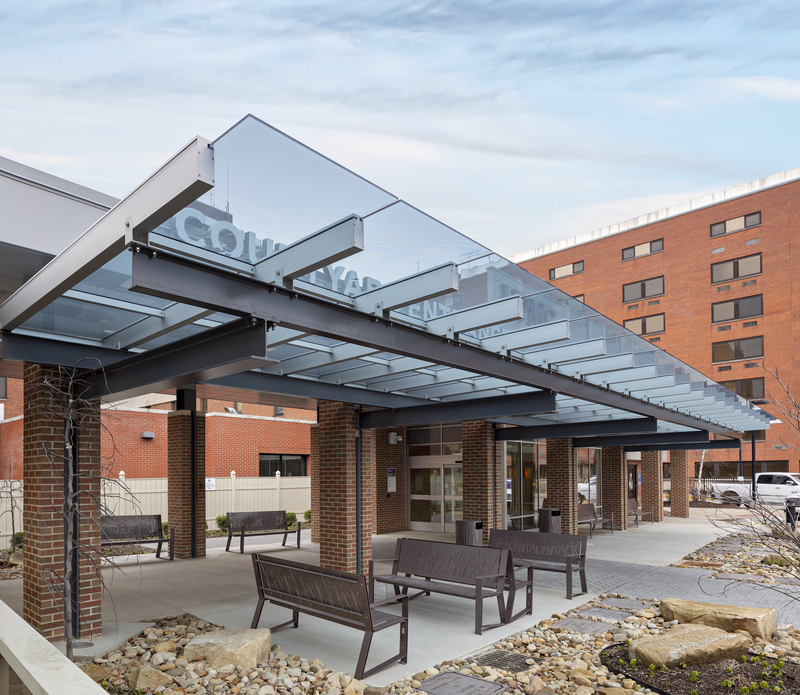 EXTECH/Exterior Technologies, Inc. (EXTECH) announces its new SKYSHADE 2500® Series glass canopy system. The canopies can be incorporated into freestanding structures, pavilions, walkways and other covered entrances for commercial, industrial and transportation applications. "Glass canopies are well suited for either contemporary or historical designs, and for completely custom creations. They blend form and function – allowing people to enjoy the sunshine and views in good weather conditions, while sheltering them from rain and snow," said Jim Leslie, general manager of EXTECH. "Our SKYSHADE 2500 system can be ordered in a variety of shapes and sizes. It is purpose-built to fabricate, ship and install quickly at competitive pricing." All of EXTECH's systems are manufactured at its facility in Pittsburgh. The SKYSHADE 2500 canopy system is engineered for long spans, up to 12-foot lengths, and glass panels with 9/16-inch or larger thicknesses. It accommodates 1:12 slopes. Optional glass coatings and custom silk-screen patterns help to diffuse the direct top-lighting and to control unwanted solar heat gain. If future updates are desired or repairs needed, the glass panels are individually replaceable. The self-supporting, aluminum-framed canopy system's incorporates continuous mullions that rigidly secure the glass. Demonstrating its structural performance, this canopy system is tested to meet ASTM E-330 deflection of less than L/240 at 60 psf. In addition, the system has passed industry-standard testing for flame spread and smoke generation, and air and water infiltration. Effectively managing water, the canopy features a proprietary, internal guttering system tested per ASTM D-331 to 15 psf. Enhancing the system's weather-resistant durability and aesthetic appeal, the aluminum framing may be specified in a choice of anodize finishes or high-performance factory-applied coatings. Contributing to sustainable design goals, the aluminum framing system uses recycled aluminum as standard. After its useful life as part of a canopy, the metal is 100 percent recyclable. To order a sample and learn about EXTECH's SKYGSHADE 2500, please visit the product webpage. For more information on EXTECH's products and services, please call 800-500-8083, email info@extechinc.com or visit https://EXTECHinc.com.